Bayasaa Bars with his fiance, Enhule Chuluunbatar, and members of his host family, Kathi Kaehler (left) and Kim Schmidt (right). In 2002, a young boy named Bayasaa Bars came to Mayo Clinic from Mongolia for life-saving heart surgery. It was a bit of a miracle for the 14-year-old, who was born with a hole in his heart. 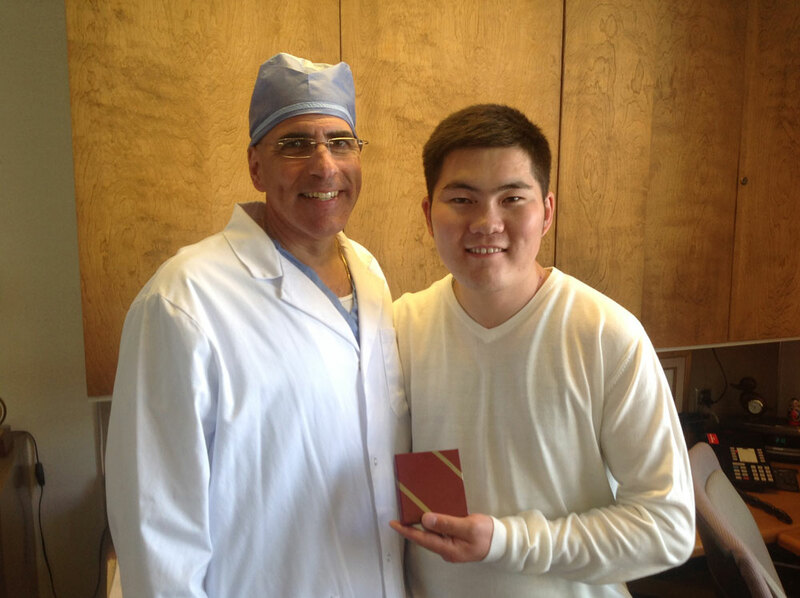 Until a surgery in Mongolia at age 8, he hadn't been able to take more than a dozen steps without needing to rest. Even after that surgery, his heart was at risk and he wasn't able to take part in many activities like other kids in his community. Just days after his surgery at Mayo Clinic in Rochester, however, he was up and walking again. And off and running. In 2014, Bayasaa's return to Rochester also was worthy of a few superlatives. Last year, after a little online sleuthing, he reconnected with his host family -- Mayo Clinic staffers (and sisters) Kim Schmidt, Blood Bank, and Kathi Kaehler, Psychiatry and Psychology, and their parents -- to thank them for what they had done to make his visit to Rochester not only possible but life-changing. 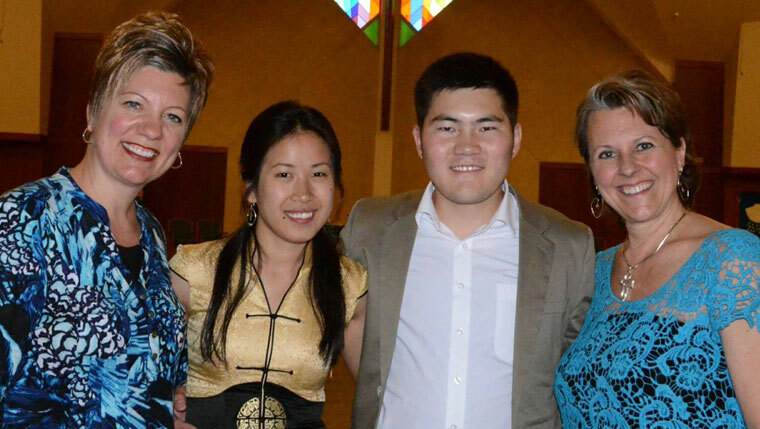 Bayasaa also wanted to thank Samaritan's Purse Children’s Heart Project and the church in Rochester, Bethel Lutheran, that sponsored him and two other Mongolian children who traveled with him. And his care team. That gave the enterprising Schmidt an idea. She asked Bayasaa if he'd be willing to come back to Rochester for a reunion if she could find a way to make it happen. And with some help from her church, she did just that. Bayasaa, now 26, and his fiancé, Enhule Chuluunbatar, arrived in Rochester last week. And Bayasaa, who has learned English in the years since his first visit, had a chance on Tuesday to address some of those who helped him. As he's gotten older, Bayasaa says he's come to understand the significance of what Mayo Clinic, the church, and his host family did for him. "People at the church, they were really, really caring about me," he says. "The Mayo Clinic and the staff were really nice to me, as well as the others. That's a really good feeling you get from here." And his host family? "It meant, to me, the world," he says. "If Samaritan's Purse kept us in hotels, maybe we cannot get such a good feeling. The host families are really good about what they're teaching you … Maybe in the future, I want to be one of them." Bayasaa with Joseph Dearani, M.D. Schmidt and Kaehler are quick to say the experience was just as meaningful for them. And it gave them an opportunity to see Mayo Clinic through a different lens. "It was great for me to see their reactions to our staff and how appreciative they were of everything," Schmidt says. "And I felt the same way. I was so proud to be a Mayo employee because they took such good care of the children and their families." Bayasaa also got to meet the surgeon who repaired his heart, Joseph Dearani, M.D. Asked what he wanted to share with Dr. Dearani, Bayasaa told us, "I just want to say really, 'Thank you from my heart, and really thank you from my family. You are doing the best job. You are giving life to children … you are a gifted person to the world." Say something you've been wanting to say below. And while you're at it, share this story with others using the handy social media tools.